Both the Massachusetts Senate and House of Representatives voted to delay the opening of recreational marijuana stores from January to summer 2018. The moves in the Senate and House were made in informal sessions with just a half-dozen lawmakers present, according to The Boston Globe. Senate President Stan Rosenberg says it was a voice vote, meaning there is no record of who voted. The vote was unanimous. The delay, which still needs to be approved by Gov. Charlie Baker, flies in the face of the law passed by voters in November. More than 1.8 million Massachusetts residents voted for legal recretional marijuana, compared to about 1.5 million who voted against it. Marijuana possession and home-growing it became legal on Dec. 15; however, it is still illegal to sell it. 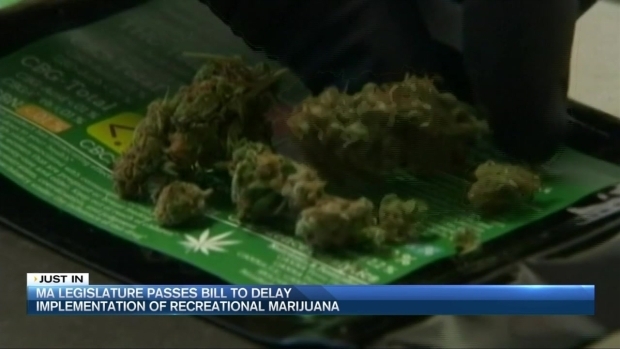 Massachusetts lawmakers vote to delay the sale of recreational marijuana by 6 months. The bill passed by legislators on Wednesday also calls for the state's Department of Public Health to conduct a study over the next 18 months into marijuana use in the state and how it could impact public health and safety. Proponents of Question 4, the ballot initative that legalized recreational marijuana, said they were disappointed by the Legislature's decision to alter the law. "We are willing to consider technical changes to Question 4 so that the new law is implemented in a timely and responsible manner. However, our position remains that the measure was written with careful consideration regarding process and timelines and that no major legislative revisions are necessary," spokesperson Jim Borghesani said. "Further, the voters of Massachusetts approved Question 4 by a significant margin, and any alteration of the law deserves a transparent, deliberative legislative process." Shanel Lindsay, owner of Ardent Cannibas in Roslindale, says a possible 6 month delay on sales will seriously hurt her bottom line. "There will be a segment of people that will only be using cannabis when they have the ease of buying it from a dispensary so yes from a business perspective this is hurting the industry just as we are trying to get out of the gate," Lindsay said. In a statement, Rosenberg said the delay "will allow the necessary time for the Legislature to work with stakeholders on improving the new law." "We will continue working diligently toward implementing Question 4, collaborating with stakeholders across the Commonwealth," Massachusetts Treasurer Deborah Goldberg wrote in a statement. Meanwhile, House Speaker Robert DeLeo said lawmakers still aim to "make sure that the intent of the voters is carried out."